“Siren” is a word that is often overused in the female-fronted metal arena. But when you’re talking about three women who pioneered a new sound -- Anneke van Giersbergen (with The Gathering), Liv Kristine Espenæs Krull (with Theatre Of Tragedy), and Kari Rueslåtten (with The 3rd And The Mortal) -- calling their collaboration The Sirens could not be more fitting. The Sirens are hitting the road for live shows that will include a mixture of classics and brand new material from their solo albums and current projects. Check out “Embracing the Seasons” and “Sisters of the Earth” for a taste of what awaits! It isn’t every day you get to interview a legend; so needless to say, when I was asked by the staff at Sonic Cathedral to have a one-on-one conversation with metal’s quintessential rock goddess Doro Pesch, it goes without saying that I was excited by the opportunity, but also very nervous as well. After all, Doro is the reason that places like Sonic Cathedral even exist. She’s the reason there is a femme-metal scene to speak of to begin with. Doro is the reason I’m here writing this right now. She’s a trailblazer; and just like the others of her kind, she only needs to be known by one name. 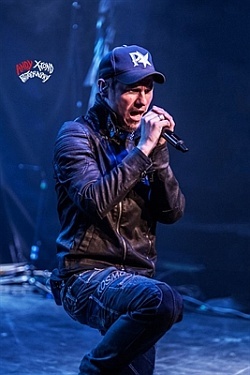 Having interviewed vocalist Jake a couple weeks after the release of Amaranthe’s debut album in 2011, it was a double treat to meet him and co-founder Olof in person before my first Amaranthe show, which also happened to be the band’s first show of their tour run with Within Temptation in San Francisco. After 12 hours of travel by car, plane, train, and bus, I showed up the interview in the nick of time, but rather discombobulated and with hair sticking up in every direction like a rabid hedgehog. Hungarian-based symphonic metal band Sorronia is causing quite a stir within the symphonic metal community, and with good cause: not even 3 years since forming and just within months of releasing their debut album, the band has already toured with notable names on the scene such as Tarja Turunen; which is no small feat for bands with twice their seniority or popularity. Sometime amidst all the crazy touring, I got a chance to chat with Anna, the band’s vocalist, about not only the tour with Tarja, but everything else from the story behind their unique name all the way up to what they’ve got in store for us next.